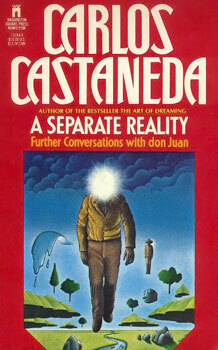 Carlos Castaneda (1925–1998) was a Peruvian-American anthropologist. He shot to fame with his first book, The Teachings of Don Juan: A Yaqui Way of Knowledge (1968), a first person account of his experiences as a trainee shaman under the tutelage of a Yaqui Indian magician, and upon which his Ph. D. thesis for UCLA was based. He quickly followed this up with two other books on the same subject: A Separate Reality: Further conversations with Don Juan (1971) and Journey to Ixtlan: The Lessons of Don Juan (1972). These were books that really fitted some of the esoteric things the ’60s were into: altered states of consciousness, spiritual experience and wise old people from neglected tribes. At first they were greeted with enthusiasm as genuinely adding to anthropological knowledge – as well as being well written and best sellers. Initially Castaneda did all the things successful academics do: gave lectures, appeared on TV, gave interviews, wrote more. But by the mid ’70s doubts arose and questions were asked, and this has continued to today. At about the same time Casaneda withdrew from public life to concentrate on his spiritual development. He gave up answering journalists’ questions, though he did write several more books and held workshops in a spiritual system he called Tensegrity. Some experts on Yaqui culture claimed they couldn’t find evidence of the sort of shamanism described; Richard de Mille wrote that he could prove that Castaneda was in the university library reading about peyote at the time he was supposed to be actually using it; others pointed out that none of the books included Yaqui terminology for what Castaneda claimed was a well developed knowledge system. But for every critic there was a counter-critic who believed the books to be true. There was also a school of thought that it didn’t matter – the books are worthwhile for themselves and not for what they may or may not refer to in the real world. I read the first three Don Juan books at the time they were being OK and true and found them readable and fascinating. Since they were accepted by academe I assumed they must be factual, though I thought some of the things described might have been a bit exaggerated for effect. Now I agree that it would have been relatively easy for Castaneda to invent all or most of the material, but my knowledge isn’t good enough to say I’m certain it’s all invented. On the whole I think it’s one big hoax and Castaneda spent the last decades of his life laughing up his sleeve. How about the third school of thought? I agree that the books make a contribution to Western culture, but I do think it matters if they are fakes. The author achieved a Ph. 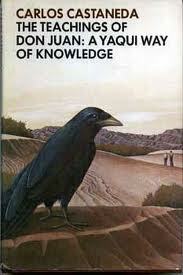 D. on the basis of his work and he sold the books as contributing to knowledge. If this was all invention he defrauded a lot of people. In my opinion his books would have done well as novels – original, thought provoking, experimental, and if we knew that is what they are they would be a grand addition to world literature. I think future generations may find that he has sacrificed long-term fame for short term gain, and his books won’t outlive his contemporaries, to whom they said something important in the world view of their time. I’ve not seen this description of the fiction/non-fiction difference before – it is very apt and clear. Thank you for it. It says exactly how I feel the non-fiction writer should see him/herself.